This healthy take on the traditional brownie is packed with bananas, peanut butter and a little chocolate. Perfect for those with food restrictions who still have a sweet tooth! 1. Preheat the oven to 300°F, and grease a 8”-square pan with baking spray. 2. In a small bowl, whisk together the flour, baking powder, salt and cinnamon. 3. In a medium bowl, add the banana, coconut oil, vanilla and Stevia. Whisk until combined. 5. Add half of the almond milk and continue folding together. Repeat the steps and fold the mixture until all the flour mixture is part of the dough ball. 4. Add half of the flour mixture and stir together with a spatula. 6. Spread the batter into the prepared pan. Bake the brownies at 15 minutes. 7. Remove brownies from oven and set aside. Heat peanut butter in microwave for 10 seconds to soften. Spread peanut butter over top of brownies. 9. Take out of the oven and gently spread melted chocolate over the top of the brownies. 8. Sprinkle chocolate chips over the brownies. Put back in the oven for 5 minutes. 10. Sprinkle with crushed peanuts. Cool completely in the pan. Cut into squares. Store in the fridge until ready to enjoy. Heat up the brownies in the microwave for 15 seconds if desired. 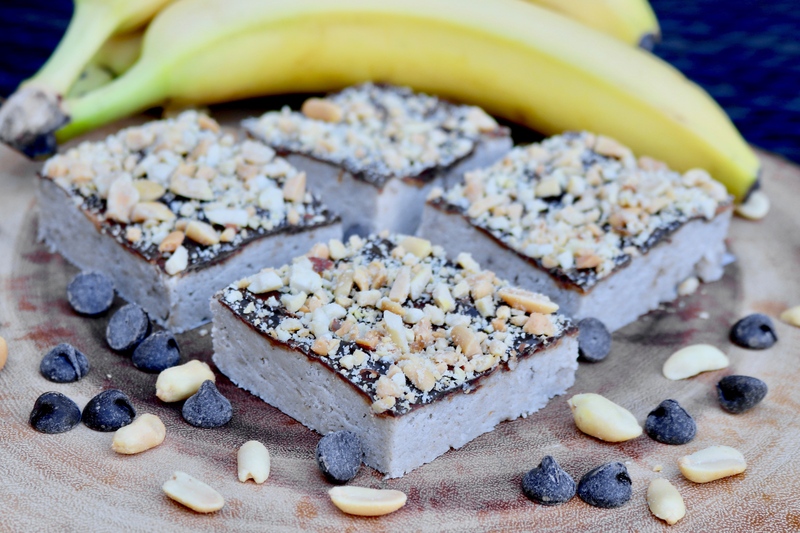 This healthy take on the traditional brownie is packed with bananas, peanut butter and a little dark chocolate. Perfect for those with food restrictions who still have a sweet tooth! Preheat the oven to 300°F, and grease a 8”-square pan with baking spray. In a medium bowl, add the banana, coconut oil, vanilla and Stevia. Whisk until combined. Add half of the flour mixture and stir together with a spatula. Add half of the almond milk and continue folding together. Repeat the steps and fold the mixture until all the flour mixture is part of the dough ball. Spread the batter into the prepared pan. Bake the brownies at 15 minutes. Remove brownies from oven and set aside. Heat peanut butter in microwave for 10 seconds to soften. Spread peanut butter over top of brownies. Sprinkle chocolate chips over the brownies. Take out of the oven and gently spread melted chocolate over the top of the brownies. Sprinkle with crushed peanuts. Cool completely in the pan. Cut into squares. Store in the fridge until ready to enjoy. Heat up the brownies in the microwave for 15 seconds if desired.